Experts say it costs about $500 to train a school employee under Texas' school marshal program. But school leaders say their worries go beyond the cost. “The latest that I heard is that the training for each marshal is about $500,” said state Rep. Jason Villalba, the Dallas Republican who authored the bill that created the Texas school marshal program Abbott wants to expand. Under the program, schools can designate one employee for every 400 students a marshal. And, Villalba noted, nearly 80 percent of Texas’ school districts have fewer than 3,000 students. That means most Texas districts, in theory, could have seven or eight marshals at most. Aside from training, Villalba said, the only other costs associated with the program are the costs of buying the guns, ammunition and a lock box (which is currently required for marshals who directly interact with students). Villaba’s measure doesn’t require schools that utilize the marshal program to get liability insurance, but districts may choose to do so, he said. It’s also possible the cost to train school marshals could decrease. In outlining his proposal, Abbott advocated for streamlining the training course — currently a “burdensome” 80 hours. Jerry Patterson, Texas’ former land commissioner who helped get the state’s concealed handgun law passed in 1995 when he was a state senator, said the other costs to schools would be minimal. Some smaller districts disagree. The state initially had a grant program in place to help districts cover training costs associated with the marshal program, but the money ran out and funding has not been reauthorized. Craig Bessent, assistant superintendent of Wylie ISD and one of the first school marshals in Texas, pointed to a lack of funding to implement the program at a Senate Select Committee on Violence in Schools & School Security on Wednesday. But one of the biggest worries for some school officials has nothing to do with cost. It’s a safety concern. The idea of arming Texas school personnel is not new. It first emerged after a shooting in 2012 at Sandy Hook Elementary School in Connecticut, which left 28 dead — including 20 children and the shooter. Villalba authored the bill that created Texas’ school marshal program shortly thereafter. Abbott’s plan doesn’t mandate arming teachers. Rather, it would provide funds to schools that utilize Texas’ school marshal program — one of two programs that arm teachers in more than 200 of Texas’ 1,000-plus school districts. A majority of Texans say they support arming teachers. According to a recent Quinnipiac poll conducted in the days immediately following the Santa Fe shooting, 54 percent of Texas parents who have children in public schools support arming teachers and other school officials. But several school districts say they’re still hesitant to participate in such programs. 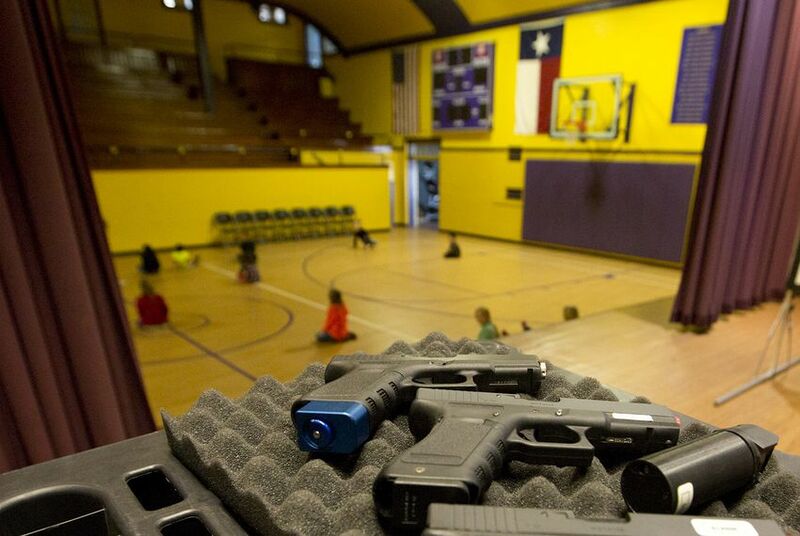 Several Texas teacher associations are also discouraging schools from arming their employees. The price to implement the program may be low, they say, but the real cost comes from the potential harm that may come to teachers and their students. “While the teacher is wasting time and endangering his or her life trying to find their gun, they should be locking the doors, putting a desk or something against the door and comforting his or her students,” said Clay Robison, a spokesman for the Texas State Teachers Association.